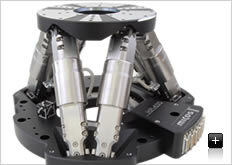 This hexapod system is a precision 6 axis parallel kinematics positioner providing high stiffness and positioning accuracy in all degrees of freedom. It features linear positioning ranges of 50x50x30 mm and rotation of Rx, Rz 20�, Ry 40� The pivot point is defined by software and can be changed by the user any time. The hexapod system comes with software and a Delta-Tau controller featuring advanced algorithms for inverse kinematic transformation. Typical Hexapod applications include statellite antenna testing, medical research, optical systems and beam-line / synchrotron research. The mechanical design ensures maximum system stiffness and spatial resolutions up to 0.5 �m. Vacuum hexapod systems are also available.